How is HyOx’s multi-patient hyperbaric chamber different than the monoplace (one-person) chambers? How does hyperbaric oxygen therapy work? What does hyperbaric oxygen therapy treat? How do I get referred for treatment? What do patients experience during a treatment? Is any discomfort felt during hyperbaric treatments? What is a hyperbaric chamber? 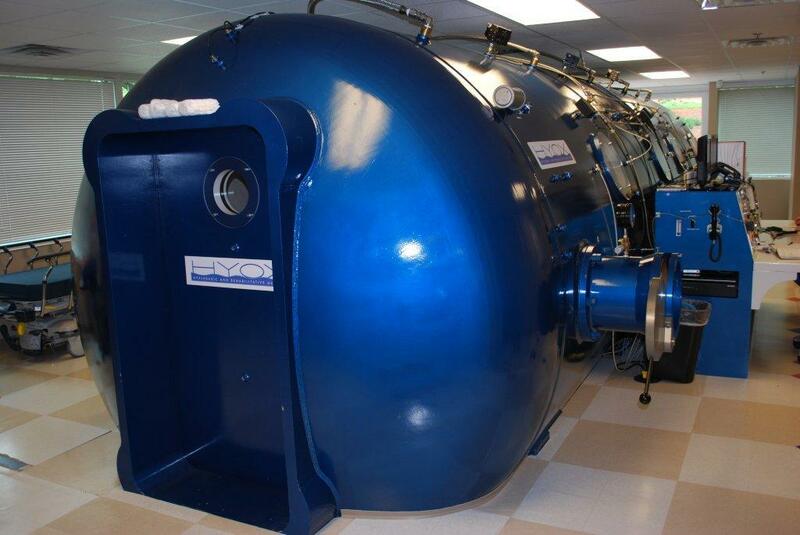 HyOx operates Georgia’s largest hyperbaric chambers to administer hyperbaric oxygen therapy. HyOx’s chamber is 31 feet in length and 9 feet in diameter. The chambers can comfortably accommodate 12 sitting patients plus an attendant or physician, who remains with patients throughout treatment. Patients pass the time reading, listening to CDs or watching videos on the chamber’s entertainment system. Refreshments are available. Medications, beverages, snacks and a private restroom are available during treatment. HyOx Medical Treatment Center has two hyperbaric facilities in NW Atlanta (Marietta) and Gwinnett. We specialize in adjunctive hyperbaric oxygen therapy (hyperbarics) and offer wound care services, physical therapy, respiratory therapy, social services and nutrition counseling to our patients. A skilled, experienced and qualified team cares for patients with an integrated and personalized approach to medicine through treatment, therapy and counseling. Operating Georgia’s largest multi-patient chambers, HyOx administers 100 percent oxygen to treat numerous medical and surgical conditions including non-healing diabetic wounds, soft tissue and bone infections, tissue injuries from radiation therapy and compromised skin grafts and flaps. HyOx has hyperbaric locations in NW Atlanta (Marietta, GA) and Gwinnett (Lawrenceville, GA). Hyperbaric oxygen therapy (also known as hyperbarics or HBO2 therapy) provides additional oxygen to a patient’s body tissues to jump-start or to expedite the healing process. This is accomplished in a chamber pressurized with compressed air breathing 100% oxygen to supersaturate the patient’s body into oxygen it needs to heal and infected, injured or compromised area. Hyperbaric oxygen therapy is primarily used as adjunctive treatments to other forms of traditional treatment modalities, such as surgery or antibiotic therapy. Under normal atmospheric conditions, the air we breathe is composed of 21% oxygen and 79% nitrogen. During hyperbaric oxygen therapy, those conditions are altered. The barometric pressure can be increased up to three times normal atmospheric pressure, while the air is changed to 100% oxygen which is circulated for the patient to breathe. The increased chamber pressure and the pure oxygen breathed by the patient combine to greatly increase the oxygen-carrying capacity of the patient’s blood. Essentially, the blood becomes supersaturated with oxygen and the supply of life-giving oxygen to the tissues increases significantly. This boost of oxygen stimulates and accelerates the body’s natural healing process. Patients are accepted either by physician referral or by self referral. A consultation is scheduled for patient evaluation using criteria established by the American College of Hyperbaric Medicine and the Undersea and Hyperbaric Medical Society. Call 678-303-3200 to set up a consultation or request a referral form by fax. HyOx’s medical team works in concert with other clinicians caring for the patient so that the hyperbaric treatments are coordinated with other therapies. Throughout the course of treatment, regular progress reports are sent to the patient’s other physicians, including photographs, documenting the patient’s progress. Upon entering HyOx’s multipatient chamber, the patients are seated in a comfortable reclining seat with a footrest. HyOx’s hyperbaric chamber can also accommodate patients who must remain prone. At the beginning of treatment, air begins to circulate. Patients can see and talk to a HyOx patient care specialist, who indicates when the gradual increased pressure is begun. When patients reach the prescribed pressure (usually 2.0 – 2.5 ATA), they are instructed to place a lightweight, clear plastic hood over their heads in order to receive 100% oxygen while in the chamber. An attendant in the chamber assists patients with this step. At this point, any fullness in the ears will stop and patients may rest, sleep, read or watch movies during the remainder of the treatment, which will last approximately 2 hours. Access to a private bathroom area also is available in the chamber. Near the end of treatment, the HyOx personnel will gradually decrease the chamber pressure. This is the decompression phase, which usually lasts for about seven minutes. During decompression, patients may experience a “popping” sensation in their ears as a result of the pressure changes, similar to that experienced in an airplane. Hyperbaric treatment is painless, but some patients may have the sensation of fullness in their ears, similar to what is experienced driving up or down a mountain road, changing altitudes in an airplane, or changing depths in underwater diving. The feeling of fullness occurs as the eardrums respond to the changes in atmospheric pressure. In order to avoid this, patients are taught how to force air into the middle ear during the 5 to 7 minutes that it takes for the chamber to be pressurized. This can be done by swallowing, moving the lower jaw or blowing with the nose pinched. Patients learn these procedures and have a chance to practice prior to their first treatment. Generally, patients experience no after effects from hyperbaric oxygen therapy. However, some patients report a “popping” or “cracking” sensation in their ears between treatments. This sensation can be relieved using the same techniques that patients use to clear their ears while they are in the chamber (similar to clearing your ears on an airplane). Regardless of their specific configuration, hyperbaric chambers are designed to safely create a pressurized environment (equivalent to 2-3 times the pressure of air at sea level) for the patient. Despite this similarity, there are differences among hyperbaric chambers. The major differences are in the manner in which oxygen is delivered to the patient and the creature comforts associated with each chamber. Monoplace chambers treat one patient at a time. Patients typically must lie flat in one position during the treatment. Usually, the chamber is pressurized with 100% oxygen which the patient breathes directly. HyOx Multi-patient chambers can accommodate up to 12 patients at the same time. Patients either sit in “airline-style” seats or lay on a stretcher if warranted by their condition. The chamber is pressurized with compressed air and patients breathe oxygen through specially-designed hoods, face masks or endotracheal tubes. Since they are not in a confined space, patients are free to stand, move about and stretch during the treatment. © 2018 HyOx Medical Treatment Center. All rights reserved.